« Either Kevin Hart Attempted the Greatest Recruiting Scam Ever or a Number of D-I Schools have Recruiting Officials Impersonating Them. Reinstitute Operation: Keep The Tigers Out The Clubs!!!!!!! 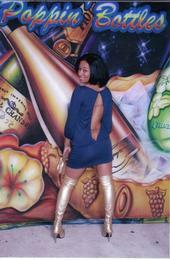 I know the pic is small, but nothing, and I mean nothing, says classy like gold thigh high boots posing in front of an airbrushed pic of a bottle of Moet…. Sound familiar??? This is the second time that the Tigers have found trouble, ironically at the same club. Back in September, sophomore Shawn Taggart and freshman Jeff Robinson were arrested and charged with inciting a riot (yes, you read that right) after senior Joey Dorsey allegedly started trouble. Truly, Dorsey showed “senior leadership”. After the first incident, coach John Calipari initiated a curfew for Tiger players, encouraging people to take pics with cell phones if any Tiger players were seen out after curfew, especially at night clubs in Memphis. Once the season started, he lifted the ban. *Have you been to the Memphis Zoo lately??? They probably haven’t either. *The Stax Museum is always informational. *Take a Tiger player and his girlfriend to the Memphis Botanical Gardens. *The Memphis Symphony Orchestra will be doing its 14th annual “MLK Tribute” featuring the Central High School Chorus (my old high school). If all else fails, take them to Gus or A&R BBQ, grab an ice cream cone from Dixie Queen, and take them back to the dorm. If the Tigers don’t make it to the NCAA Final Four and win the whole damn thing, don’t blame them if half of the bench is locked up in 201 Poplar. It will be Memphians who are at fault. Just ask yourself the following questions: What time is it??? Why are the Tigers at the club again??? And what can I do to get these guys out of the club and back to the dorm…safely??? If all else fails, if they are at the plush, there is a church right around the corner. Pray that something else doesn’t happen. Author Terri Woods guest denied entry into club because they were black? This entry was posted on February 6, 2008 at 11:35 pm	and is filed under College Basketball, Conference USA, Crazy Women, Discipline, ESPN, Memphis Tigers, NCAA, boosters, crazy, dumbass. Tagged: church, drinking, drunk, gremlins, Joey Dorsey, John Calipari, Laparis Woods, Memphis, myspace, nightclubs, Robert Dozier, safe, Shawn Taggart, skripper, stripper. You can follow any responses to this entry through the RSS 2.0 feed. You can leave a response, or trackback from your own site.